Smith's Baskin owl sculpture has been moved to Capen Garden to protect it during the renovation of Neilson Library. When Paula Ferris Einaudi ’65 arrived at Smith for commencement and reunion celebrations in May, she immediately went in search of a beloved campus touchstone: a bronze owl sculpture by artist Leonard Baskin that had stood in front of Wright Hall since 1963. Einaudi, a former Smith trustee who lives in Maryland, was alarmed when she crossed Chapin Lawn and saw “a big hole in the ground” where the owl should be. Einaudi was relieved to learn that the iconic bird sculpture—which is part of the Smith College Museum of Art’s collection—had been moved in March to a spot in Capen Garden, as its original location is in the footprint of the new Neilson Library. A harness and protective lumber frame were rigged to protect the owl and its granite base during the move. For Einaudi and other members of the class of 1965, the change brought back vivid memories of another owl move that temporarily ruffled feathers on campus. It was 1985, the year of the class’ 20th reunion. Eager to visit the owl sculpture, alumnae were dismayed to discover it had disappeared from its perch in front of Wright Hall. “It had been removed during another library renovation that was going on at the time, and nobody seemed to know where it was,” recalls Peggy White Leppik ’65 of Minnesota, who had just been elected class president. Leppik—a former 12-year member of the Minnesota House of Representatives—organized an informal search party to track down the huge bronze bird. Why was the owl so important to members of the class of 1965? Leppik says students of her era also enjoyed playful interactions with the owl, frequently leaving eggs beneath it and decorating the sculpture with leis, scarves and hats. After finding the owl in storage, members of the class of ’65 launched a fundraising drive as part of their 25th reunion class gift to return the sculpture to its home base in front of Wright Hall—a spot originally commissioned by an anonymous donor, according to a news release in the Smith College Archives. 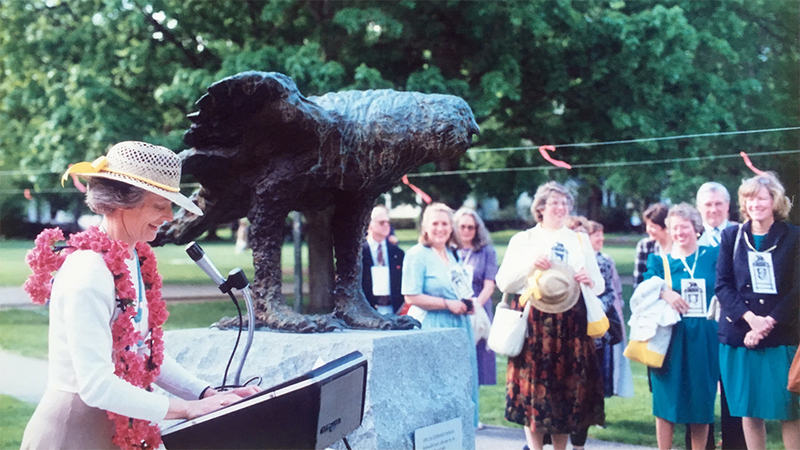 Peggy White Leppik ’65 speaks at a 1990 reinstallation ceremony outside of Wright Hall for the Baskin owl sculpture, a campus touchstone for her class and many others. Regardless of the owl’s location after work on a new Neilson is completed in 2020, Einaudi and Leppik hope the artwork will remain an icon for future generations of Smithies.